Around the city, it’s easy to see that a number of localities are struggling to manage their waste. Heaps of trash lie around on the sides of roads, and are cleared only occasionally. 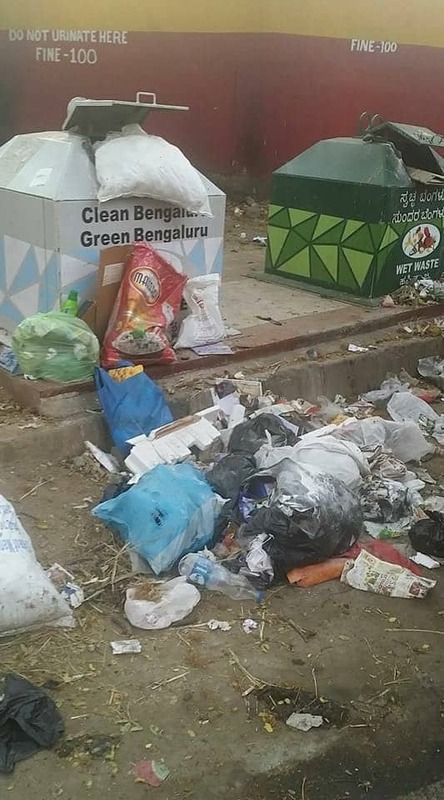 The BBMP has tried various things to stop this – from warning signs to pleas to decorating a few places hoping that people will be reluctant to dirty them. None of this has worked. Now comes a different explanation. Some communities want to bring back the old bins. Until about a decade ago, the municipality used to have bins at street corners and people would dump their rubbish into – and sometimes around – them. 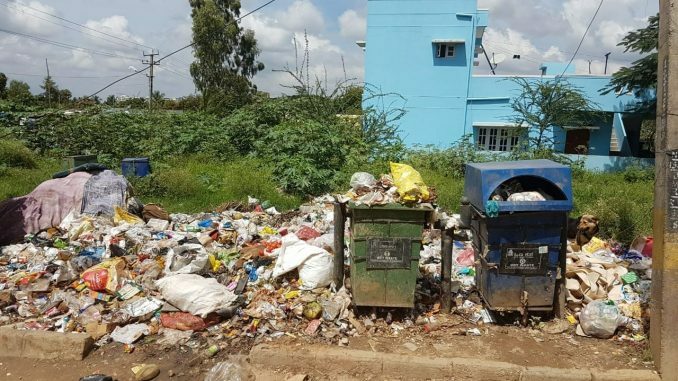 It is now being claimed that was more convenient, because it allowed people to dispose off their waste at whatever time they chose, rather than having to synchronize their lives to the work routines of BBMP pourakarmikas. But that’s easily solved, with a bit of effort. If indeed the BBMP workers are coming around too early or too late to pick up trash that is generated around the city, surely that’s something that can be sorted out by putting heads together at a local level. The waste contractor, the area in-charge of Solid Waste Management, and the local citizens’ association should be able to come up with a routine that works better. Actually, the call to bring back the bins is about something else. In all waste management in our cities, there is the risk of an unspoken nexus between two sets of people – residents who simply want to see their trash gone with the least effort, and contractors who are paid by the volume of waste they handle and the distances covered by their trucks. Both groups have a common interest in mixed (i.e., un-segregated) waste. And that common interest can bring the whole edifice of waste management down. The key word in all this is mixed. Keep that in mind, and then let’s think through the rest of the journey of waste. It’s the easiest thing in the world for an urban dweller to put all his rubbish into a single bag and then toss that into a bin down the street. In doing so, he would benefit in three ways. First, he would not need to sift the trash in his home and put them into different containers. Second, he would not need to put the smelly containers outside his own hone. And third, he need not accept any responsibility for what the city does with his trash. Out of sight, out of smell, out of mind. But local ‘ease’ creates a lot of distant worry. Mixed trash is difficult to recycle, and therefore more likely to be taken to a landfill. Contractors like this, because it means they get to run more trucks to landfill sites and bill the city for those trips. The worst of them, in fact, take some recyclable stuff out, dump the rest on roadsides and still bill the city as though they had completed the trip to the landfill site. This is one reason why our SWM bill is much higher than those of other Indian metros. Landfill sites tend to be ‘somewhere else’, in the minds of city dwellers. But other people live in those other places that trash is taken to, and they don’t understand why they have to host the trash we send them in heaps. They recognize that the soil and health problems they suffer, and the general loss of live-ability in their communities, really ought to be solved by their urban fellow-citizens in their (our!) own backyards. Naturally, they protest. The state government too is an ally of this nexus, and understandably so. There are 15,000 votes in Mandur, and 7 million votes in Bengaluru. From a political vantage point, it’s an easy decision to support city dwellers and condemn the villagers. And in the process, if a few contractors can be helped, even better! – after all, those same contractors are useful sources of campaign funds for the next election. That’s the problem with asking for the street corner receptacle. It is tantamount to asking for the continuation of a system that does great harm – to people outside the cities, to the environment, to our food supply, and much more. There is an alternative, and we have plenty of examples, in fact. Hundreds of communities around the city already segregate their trash in their own homes, compost and convert wet waste, recycle a big chunk of their dry waste, and rely on the city for only the residual portions that they cannot self-manage. In fact, the law even requires them – those who live in apartment and villa communities – to do all this. We need to adopt and adapt that system for the rest of the city too. The most important lesson from these experiences is that waste should be collected only after it is already segregated in each home. Any system that does not force the residents themselves to accept responsibility for segregation will have a high risk of failure. Just as housekeeping staff in self-managed communities do, in the rest of the city too we should have collection of segregated waste at source, and further sorting, composting, recycling, etc. in a nearby location. But where’s the space for all this, some people ask? In many localities there is simply no space to manage waste locally, they say. Maybe, but the answer to that is trivially simple – BBMP should buy the space it needs for waste management. Even at a steep Rs.1 crore per site, we can buy three sites in each ward with the Rs.600 crores that is now spent on waste management every year. And in many wards BBMP already has some land that it owns, so it wouldn’t even need to by all the sites. There is surely enough money to not only buy the remaining lands we need, but even to invest in world-class processing technologies for local waste management. What we don’t have is the will power to do this. We should never give up on responsible self-governance and the public good. When we do that, with every convenient step we take for ourselves, we will also create a bit more harm for others. The street-corner receptacle is a part of that awful system of convenience and harm. We’ve bin down that road before, and should know better than to take it again. This was originally published on Deccan Chronicle as part of the author’s column, and re-posted on Facebook account of the author.